When I first got the Panasonic GH1, I noted down some improvement areas for the camera. While it was a good camera, there where many areas where I felt it could be improved. Upon getting the GH2, I am happy to note that many the items have been ticked off. Some of the items I wrote down were very unrealistic, like implementing in body image stabilization. Panasonic have chosen their strategy, to implement image stabilization in some lenses only, not in the camera bodies. So this is not going to happen. The control wheel has been moved to the rear side, which I prefer. The built in flash has become taller (as can be seen in the images below), meaning that the premium kit lens Lumix G HD 14-140mm casts a smaller shadow when using the flash. The new camera does feature a simplified focus scale in the display when focusing manually with a Micro Four Thirds lens. This is not an absolute focus scale with measurements, but it tells you if you are moving towards the close or far end of the focus scale, for example. The camera can autofocus with more Four Thirds lenses. For example the Olympus Four Thirds 50mm f/2 1:2 macro. However, the focus is slow for some of these lenses. When using legacy lenses, you can access the magnified focus assist view by pressing the rear control wheel. On the GH1, you needed to press two keys to get this mode: First the left arrow key, followed by the down arrow key. There are also some development areas that remain. For example, the buffer clearing speed is very slow when recording both JPEG and RAW images. The basic shape remains very similar. The shell has been made from a different plastic material with a "crinkle" appearance. While the majority of the GH1 body was covered with a rubber-like covering, the shell of the GH2 is more slippery. On the other hand, the GH2 gains a more solid rubber grip. Somehow, I find that the rubber-like surface of the GH1 feels safe to operate: The camera is less likely to slip out of your hands. On the other hand, the GH2 has a better grip area for the right hand. Some people have reported that early versions of the G1 had the rubber surface peeling off. This caused negative publicity for Panasonic, and may be the reason why they have chosen a plastic surface without the rubber coating for the GH2. On the rear side, we can note some changes. 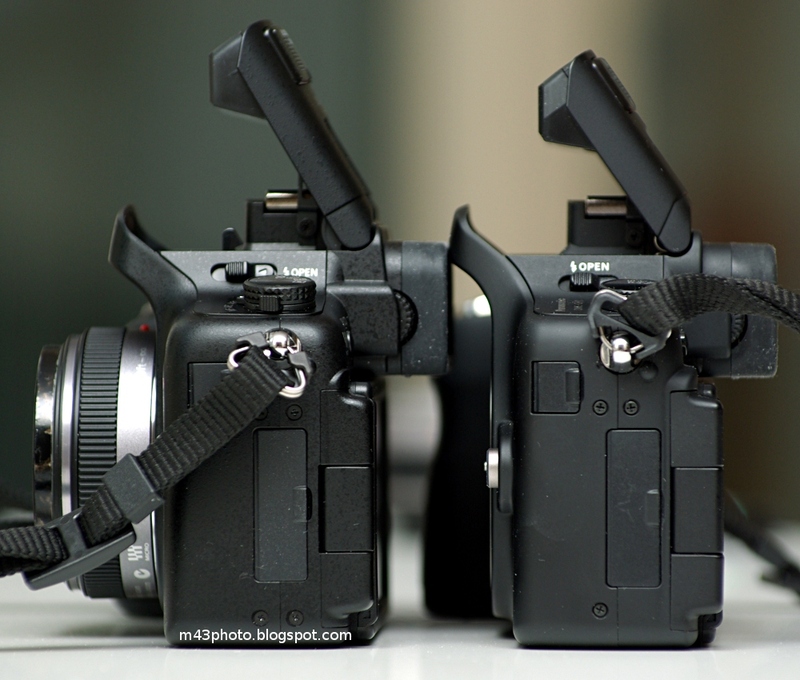 The GH2 (left) has a more pronounced frame around the LCD, which I suppose is good for protection. The red video record button had to be moved to the top-side, since the space it previously occupied is now taken up by the thumb wheel. A subtle, but good change, is that the display button has become flatter. On the GH1, it was easily pressed by a mistake, and now this is not a problem anymore. From the side, we can see that the SD card compartment has been moved a bit inwards into the camera. My speculation is that this was needed to fit the extended processing power in the GH2 camera. This placement makes the card a bit more awkward to extract: There is little space for your finger between the card and the compartment door. As a consequence of the new SD card placement, perhaps, the battery needs to be slimmer. 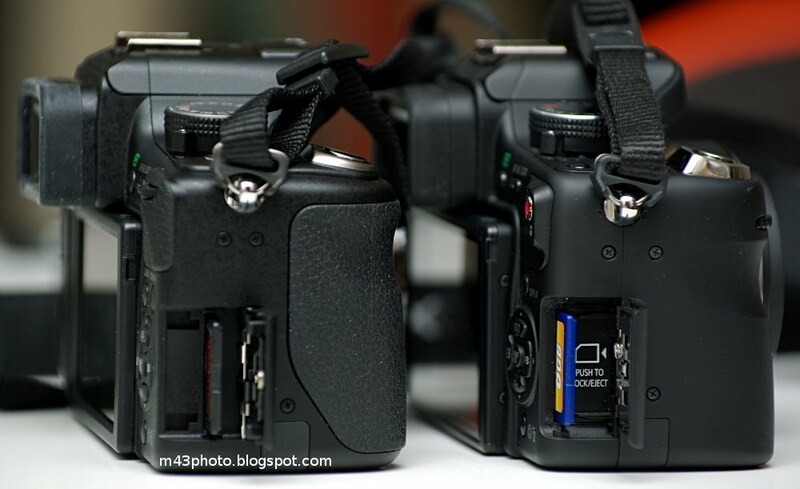 The GH2 battery (DMW-BLC12, left) is new, which has angered some fans. This means that you can not reuse your extra GH1 battery (DMW-BLB13) for the GH2. In this view, we also see that the tripod mount has shifted backwards. In this side view, we see that the new flash is taller, which is very good news. Ideally, the built in flash should be as far from the lens as possible, when extended. The GH1 was marketed as a hybrid stills and video camera, the first in it's class to have continuous AF during video recording. In the mean time, some competitors have launched their systems. So to regain the throne as the best video enabled system camera, the GH2 must excel in video quality. My experiments so far indicate that the GH2 does indeed provide better video quality. 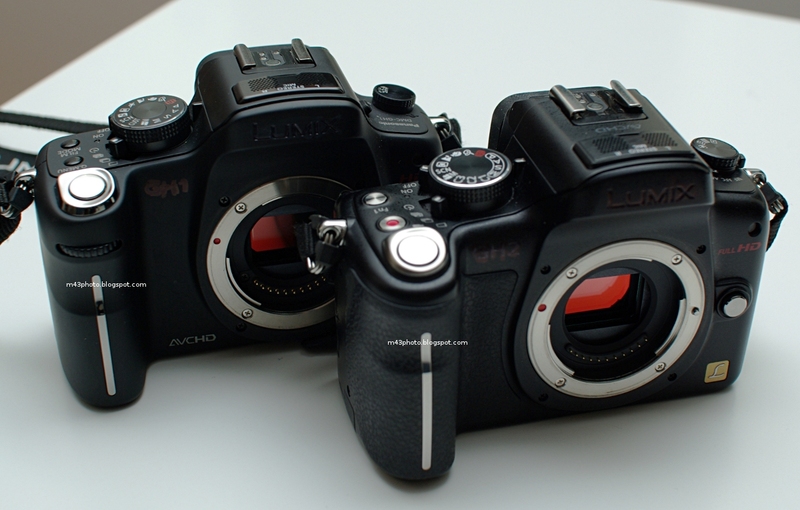 I devised a simple test to compare the GH1 (hacked) with the GH2 in otherwise identical settings. What I found was that the white balance and saturation of the GH2 is more pleasing, and also that the sharpness of the video is probably a tad bit better. But in my opinion, there was not a dramatic difference. The GH2 features a much appreciated ETC (Extended Tele Conversion). This is essentially a digital zoom that works during video recording. So your lenses become 2.6 times longer, and you can still record at full HD 1080 resolution. 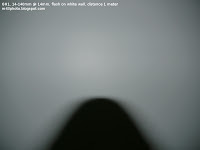 I've also checked the rolling shutter properties of the two cameras. I found that they were mostly identical in this respect. The GH2 might be slightly better. Anyway, rolling shutter artifacts is not a huge problem with the GH1 and GH2 cameras. Unless you deliberately generate the artifacts, you're very unlikely to find this being a problem. This is in contrast to the Samsung NX10, which I found had significant rolling shutter artifacts. While I had no problems with the autofocus speed of the GH1, I am still happy to see that they have further improved with the GH2. I'm especially happy that the autofocus has improved when using the Lumix 20mm f/1.7 pancake lens, which felt a bit sluggish on the GH1. Here is a summary of my AF speed readings. The GH2 appears to be better at continuous autofocus too, according to my test. As mentioned above, the GH2 has a taller built in flash. In theory, this should be good for several reasons: Keeping the built in flash as far away from the lens as possible is generally a good idea. It makes the lightning more flattering when photographing people. 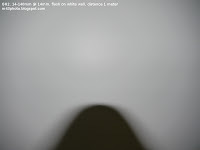 Also, it is a known fact that the GH1 built in flash casts shadow when using the premium kit lens Lumix G HD 14-140mm. Here's how the shadow looks using GH2 (left), and GH1, both at 14mm and having the lens hood attached. As you can see, the GH2 flash reduces the shadow cast a tiny bit, but the difference is rather subtle. On the other hand, you would probably not use the flash at 14mm focal length and 1 meter distance very often. And increasing either will reduce this problem. So for real life use, this is not that much of an issue. Mirrorless cameras, like the GH1 and GH2, typically require a pre-flash to measure the intensity of the flash. This takes some more time than with DSLRs, since mirrorless cameras don't have a light sensor. They use the imaging sensor as a light sensor. Compared with most DSLR cameras, the battery life of the GH2 is not very impressive. This is due to operating in live-view all the time. DSLR cameras don't need the LCD for viewing during SLR mode, and save power that way. With freshly charged battery, I found that I could record 144 minutes of video before needing a recharge. This was with the LCD display on all the time. Using the EVF rather than the LCD probably gives better battery life. It is possible to buy third party batteries for around US$20, but they give some reduced functionality. In light of the controversy surrounding the "Improved ISO sensitivity" in the GH2, it would be interesting to see an image comparison at ISO 1600 and ISO 3200. Yes, I agree. But I don't think I'll test the high ISO capabilities just now. The GH-1 does shoot PAL 25fps, the GH-2 does NOT. how does an unhacked gh1 compare to a gh2? does the hack make that much of a difference? Regarding the video quality, I have tried to make a comparison of GH2 vs hacked GH1 here. It is pretty clear to me that GH2 gives a better video quality. However, the video quality is only one aspect of the camera. 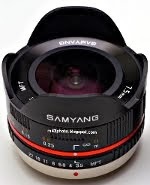 In many other aspects as well, the GH2 improves upon the GH1. Excellent illustrated comparison between the GH1 and GH2. Your article makes it clear that Panasonic is refining their designs, despite looking similar at first glance. There's a small error in your text: the GF2 does not use the same battery as the GH2. The GF2's battery is slimmer and longer (7.2V 1010mAh 7.3Wh) than the GH2's higher capacity battery (7.2V 1200mAh 8.7Wh). This means carrying 2 different sets of batteries and 2 chargers when I go on a trip where the GF2 serves as the backup camera. Thanks for pointing this out! I read that the GF2 has the same battery somewhere, it was not my own experience. I'll change the text to avoid confusing people. how about EVF? any changes there? The GH2 EVF has a slightly higher resolution. Perhaps a bit better clarity as well. But both EVFs are very good. Hi, I was wondering, have you noticed the audio going out of sync recording in 720p AVCHD during playback on a PC (pre-editing)? I did a Google search on this and found the same questions and someone suggesting the PC cannot handle the HD playback causing the audio to become out of sync. I don't think it's the PC coz I have the i5 quadcore Sandy Brige CPU with 8GB RAM. Plus, when recording in 1080p 24fps I don't see the audio going out of sync, it only seems to happen when recording 720p 60fps. Very strange. Sorry, I can't comment this. The biggest difference for me is the gh2 has true 60fps while the gh1 only has 25 fps coming off the sensor and then fakes the remaining frames when doing 60fps. I have the GH2. Seems to be a fine camera, especially paired with the new 45-175mm power zoom lens. What I have found to be the most outstanding trait of this camera is the consistent exposure, almost perfect. They did leave out several things that could or should have been included,....the ability to set a minimum shutter speed, for example. The Panasonic GH2 is an excellent light weight camera (with some very good interchangeable lenses) for video and stills. The ergonomics are good and you can control the camera's most important functions quickly with buttons. Also, I find the menu system easy to understand. Just a great camera. How did you darken the "Lumix" brand on those cameras? I would like to do the same so that they can be more low profile when street shooting. Thanks! I just used a black permanent marker pen. Haha, thanks. Is it a reversible procedure? Honestly, I don't know. I think it is ok that the "Lumix" text remains black, so I don't care.